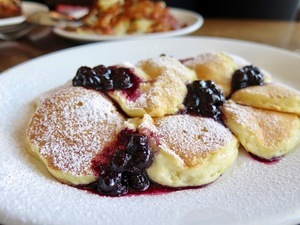 The truly sublime lemon-ricotta “corzetti” pancakes at Locanda. All photos: © tablehopper.com. 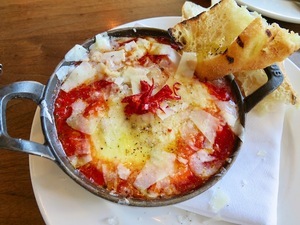 Eggs in purgatory at Locanda. 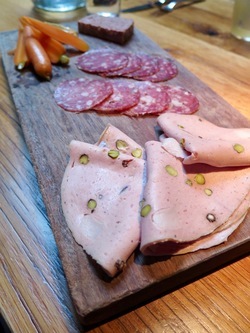 Salumi for brunch at Bar Agricole, yeah, you want that. The famed malasadas with guava custard at Aina. Portuguese sausage hash (with Brussels sprouts underneath) at Aina. 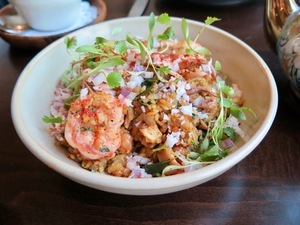 The can’t-miss squid and prawn poha at Rooh. 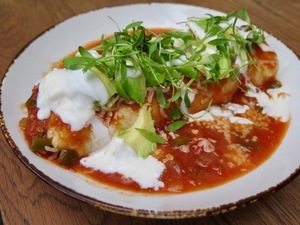 Breakfast burrito love at Horsefeather. 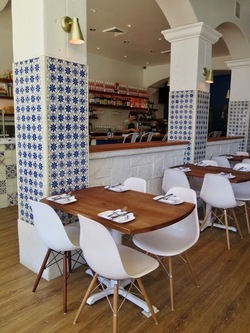 Uma Casa’s cheerful seaside-like interior. 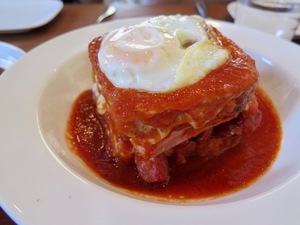 The gut-busting and hangover-curing Francesinha at Uma Casa. 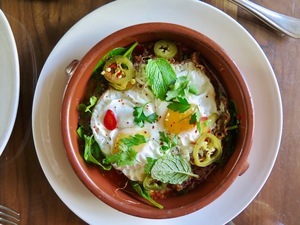 Smoky pork ragù with fried eggs, sweet peppers, and pickled chiles at Bluestem Brasserie. The Vida Fuerza at Flores. Contrada’s breakfast pizza with soft-scrambled egg, smoked trout roe, crème fraîche, and fresh herbs. 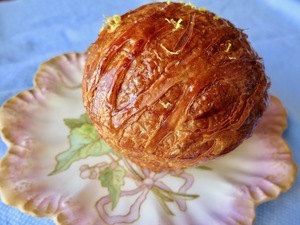 The glossy exterior of the cardamom lattice bun at Jane the Bakery. And here’s what’s inside the cardamom lattice bun at Jane the Bakery (hold me). Brunch in SF is one of our treasured pastimes (excuse me, contact sports). There are always places starting up brunch service, and then some sadly discontinuing it (I am currently pouring some out for Aster’s and Cala’s brunches, they were sooooo good). I think brunch is a smart way to check a place out that you’ve been curious about, with its somewhat friendlier price point. (Well, except if you’re a lush with a penchant for $24 glasses of Lanson Champagne, and I love you for it.) Anyway. Here are a few highlights from 10 San Francisco places serving brunch around town, from the new to the established, from restaurants to bars. Hopefully you feel inspired to get some new spots and dishes in the mix—don’t let all these calories I consumed for you be in vain, okay? Thanks. The space is so chic in the daytime, with the pop of color from sunny yellow espresso cups, and then there’s the amaro-centric brunch cocktails that are designed to help you, like the Ciociaro spritz (Ciociaro, amaro blend #3, lemon, Prosecco), which is the move. Making a reservation in advance, also smart. Another place that is absolutely gorgeous during the day is Bar Agricole’s Sunday brunch, with its soft light from the skylights above. Score one of the booths in the back with your friends and it’s an instant celebration (although then there’s that patio…). Have you visited this sweet Dogpatch spot yet? Talk about mahalo vibes. 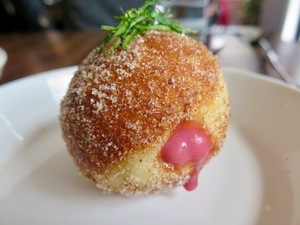 The friendly staff, the sunny corner, all the cute succulents and plants…and then you bite into the malasadas filled with guava custard and say, “Whoooooa, dude!” You will. Go ahead, bite the malasada and try not to freak out. 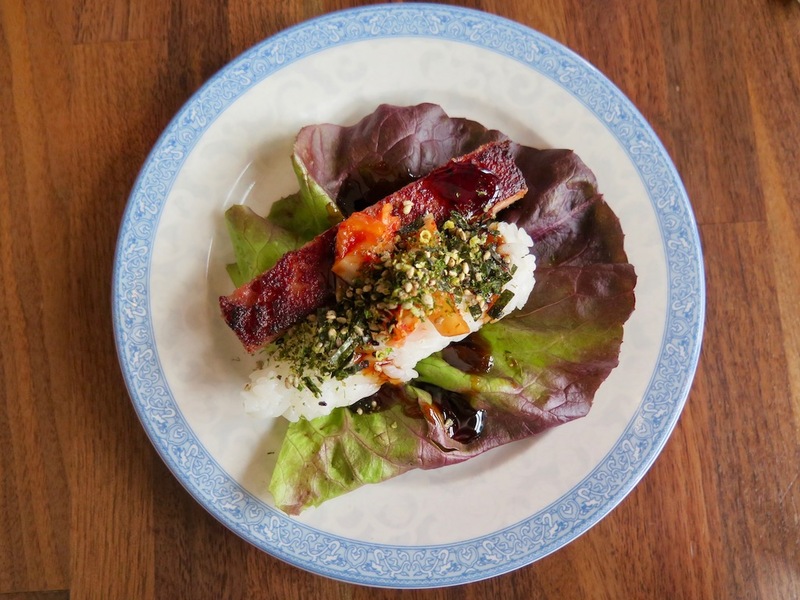 Chef Jordan Keao goes the extra mile on everything, from the housemade Spam musubi (made from a whole hog they get in from Stone Valley Farms) to the gorg garnishes. There are perfectly fried sunny-side-up eggs on the kalbi loco moco and the Portuguese sausage hash with Brussels sprouts, plus there’s housemade lap cheong sausage, and they even fly in Punalu’u Bakery taro bread for the French toast. Dedicated! 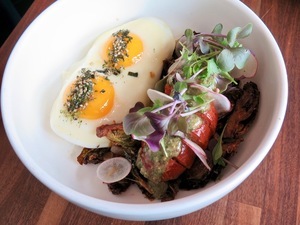 This Indian newcomer to SoMa has a punchy, colorful look, and the Saturday brunch is a fun way to check out chef Sujan Sarkar’s progressive Indian culinary style—and the Goan chorizo Scotch egg they serve at the bar at night. 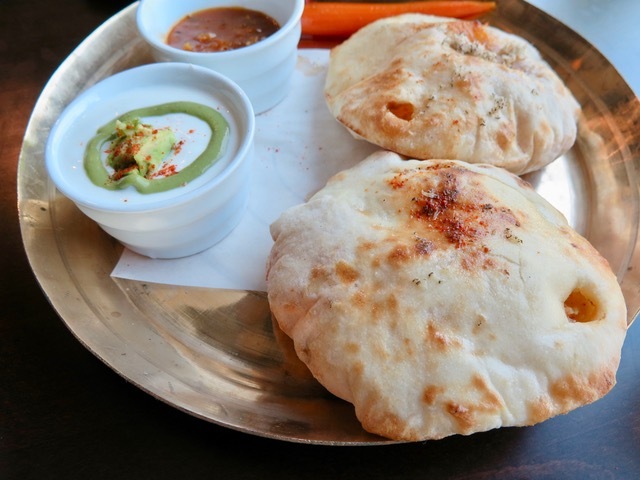 You’ll also get to try their puffy and warm housemade kulcha (the paneer tikka, chile, and Parmesan kulcha is a fave). Don’t let the idea of squid put you off, because the tender squid and prawn poha was a top dish, a flavorful rice number with cilantro and fresh coconut. Egg dishes include a masala omelet with buttery pao, or baked eggs, or with keema (lamb) Hyderabadi. There is quite the list (and playful presentation) of cocktails, but it was the Chennai Colada—so tropical fruity and refreshing with fresh curry leaves—that is the pick if you aren’t up for any booze. One of the better additions to the Divisadero Corridor of late (we needed a cute bar! ), but did you know they serve brunch on the weekend? Snag a spot on the sunny enclosed patio/atrium and get yourself the Sergeant Major, with rye, cold brew, vanilla almond milk, and maple syrup (reporting for duty, sir!). Their dream Cali breakfast burrito is something special, with housemade chorizo, home fries, scrambled eggs, cheese, and a ladle of arbol salsa, but I do hope the chilaquiles come back, they were bonkers good. (Although the replacement mushroom toast, soft-shell crab Benedict, and smoked trout scramble, I’m not mad at any you either.) The late brunch hours are also very industry-friendly. Wish you were in a seaside town in Portugal for brunch eating shellfish? Yeah, me too. But the cheerful interior of Uma Casa, with its blue and white tiles, airy style, and raw seafood bar can help transport you there. Co-owner Nora Furst’s brunch cocktails are the bomb, like the Olhos Abertos (Alessio Chinato, coffee, Angostura bitters, orgeat, and a big spoonful of cream on top). You should start with the warm rissois de cåmarão (creamy shrimp turnovers with béchamel) and the yellowfin tuna salad with quail egg and a dusting of dehydrated olive (chef-owner Telmo Faria likes to add modern touches) served with their rather brilliant potato chips. But let’s talk about why you’re really here, and I hope you brought some friends to help. Meet the Francesinha, one of the classics in the pantheon of hangover cures (or “I’m drunk and it’s 3am” scenario), an import from Porto. It’s a demented sandwich filled with linguiça (love the one they use here), thin, rosy slices of roast beef, and ham, with Havarti melted over the top and topped with a tomato-beer sauce and an over-easy egg (well, it’s supposed to be—ours arrived over-medium). Our entire table groaned with one look at this beast and then proceeded to attack it until the last bite, dipping Uma Casa’s tasty fries (they have a way with potatoes here) in the tomato-beer sauce. There are a few other egg dishes, and you could do a lot of damage at the raw bar, but really, the Little Frenchie is something else. Make sure you have a long walk home. And some Lipitor waiting for you. You have some friends visiting and want to do some weekend downtown shopping? You need to lay down some brunch bedrock first. Start with a cinnamon roll the size of your head (I’m not kidding, it’s a monster) or fellow smoky fish lovers will veer toward the smoked trout tartine with some crunchy seasonal vegetables. I’m sorry to say the fried eggs on smoky pork ragù with pickled chiles appear to have taken a turn off chef John Griffiths’ menu, but am sure the croque madame would console me, and the duck confit salad with a mustardy herb dressing and fried duck egg is a standard here for a reason. An extensive list of fun brunch cocktails—like the Bacon Bloody Mary (with bacon-infused vodka, celery salt rim, and housemade pickles) and the unique What’s Up Doc (carrot juice, ginger beer, and vodka)—will prep you nicely for some tipsy shopping. 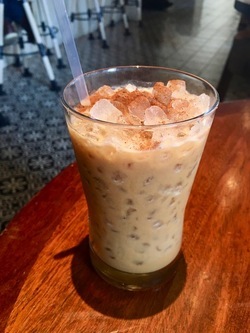 In the thick of the Cow Hollow scene is this Mexican newcomer in the former Betelnut space, with a tropical and tiled look that transports you to Cozumel in a flash, and is serving one of my favorite spins on a cold coffee drink, the Vida Fuerza, with cold brew, coconut milk, and cinnamon. Heaven. 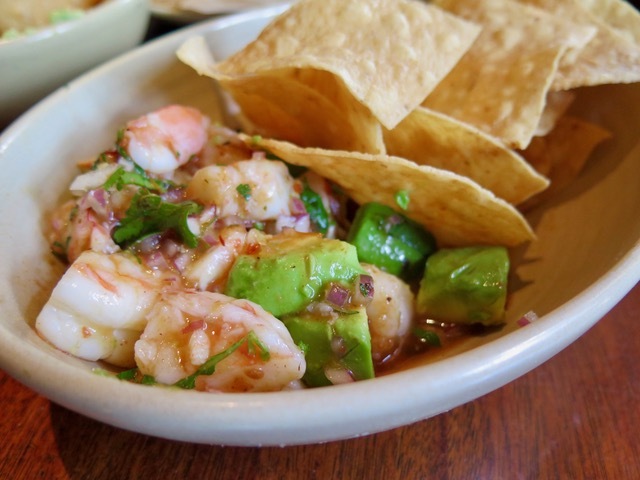 Dive into the coctel de camaron for some of the tastiest, fresh, and plump shrimp and creamy avocado in a spicy burnt tomato sauce that you can scoop up with crisp and thin housemade chips. Of note: they make their tortillas by hand from their own masa daily. Chilaquiles with braised beef and perfectly sunny eggs and guac for $14? Gracias, chef Alejandro Morgan. 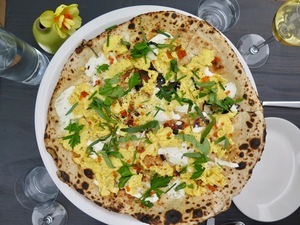 Are you thinking you’d like some fresh air, a sunny back deck, and a breakfast pizza with soft-scrambled egg, smoky trout roe, crème fraîche, and fresh herbs? Yeah? I know just the place. The pizza crust at this Cow Hollow spot is a beautiful thing, both elastic and crisp, with developed flavor—so yeah, get a pizza. The backyard is a little hideaway off Union Street, and chef Jason Tuley’s Cal-Italian menu has some notable salads (it’s amazing how many places don’t do salads well), rustic dishes like polenta and eggs, and a farmers’ market Benedict; the menu definitely leans more to the savory side. Low-ABV brunch cocktails are well thought-out, from spritzes to sangria, and there are some excellent wine selections for you to discover—just ask the friendly staff. I know, it can be hard to get up and go out on the weekend. So here’s an idea: pop on over to the newish Jane the Bakery outpost on Geary, which handily has a little (and extremely rare in SF) parking lot, and you just may be a lucky duck and score a spot. (Trust, I am hoping for you.) 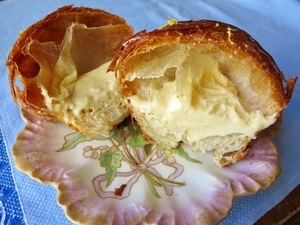 Stumble in the bakery, point to the cardamom lattice bun (the sensation of biting through the buttery laminated and flaky dough into the incroyable cardamom pastry cream inside, mamma mia, it’s errrrrything), and you could also bring home their sausage and egg cheddar-chive biscuit sandwich (or decadent croissant egg sandwich with avocado) or you can lose your mind over their fresh-from-the-oven flatbread with three cheeses (it rotates daily). Grab some of their fresh juices and espresso drinks (made with their own roast) and head back to your nest. Don’t forget a loaf of whatever catches your eye that day, from green olive polenta thyme bread to their creative daily specials (just ask! )—get crumbs all over your bed, go for it. Kudos to Amanda Michael and her amazing team for just cranking out the carb happiness over here (and they have a bunch of gluten-free options, too). Best of all? You can enjoy this goodness every day of the week. Holla.